In the partly-lit wedding hall located on the busy East Car Street in the temple town of Chidambaram, Tamil Nadu 20 young dancers sweat it out at a rehearsal on Thursday, February 27. In the far end, in the kitchen local cook Vageeswaran is tasting the sambhar and rasam which will be served for lunch close to noon. 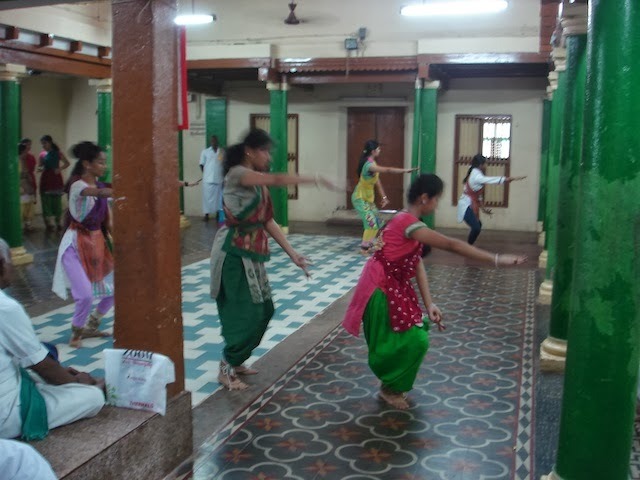 After that long workout, the young ones from Nritya Kala Niketan, Mumbai who are on their first tour of this area and will feature at the Natyanjali Dance Fest later on Sivaratri night, will enjoy the meal in the wedding hall's dining room. Here in Chidambaram, the dance and the hospitality is what makes the festival a warm and special one. And, the opportunity to dance in front of Lord Nataraja in this great temple is a rare one. We arrive here at about 11.30. A nice drive down the East Coat Road with small stops to refresh. There is little in the town's centre to indicate that a major dance festival is about to begin in the famed temple. The townsfolk are aware. But not the tourists; we spot lots of them, foreigners. - Photo is of the Mumbai dancers at rehearsal. Shama from Bangalore . . .
Day 2 opens . .
Padma keeps her date and time . . . The long tani. On the other side . . .
Remembering a veteran . . .
Bad lines, slow postings . . The Sri Lankans are here! Live web streaming . . .